It's a nearly forgotten fruit, rarely thought of these days except by old-soul cooks with a farming heritage. Utter the word 'rhubarb' and watch the listener's face contort as though the poor devil had just bitten into a lemon. Some decry rhubarb as an invasive species that crowds out the dainty pansies in the flower bed. Yet their disgust of rhubarb is simply due to ignorance. Like the gooseberry, rhubarb can't be fairly judged by gossip alone -- one must savor it firsthand to discover the wondrous tastes that lie within. You can find rhubarb in commercial pies in the grocery store, but rarely in its purest form--it's often watered-down with the ubiquitous strawberry. The most talented and creative professional chefs of our day covet rhubarb for its red pastel color, floral perfume and tart flavor--the perfect accompaniment to a rich slice of sautéed foie gras. Yes, my friends, rhubarb is back in vogue and summer is the perfect time to welcome back our cherished eG Cook-Off series with rhubarb in the leading role. (Click here http://forums.egulle...cook-off-index/ for the complete eG Cook-Off Index). Rhubarb - pronounced 'roo-barb' - is known as the pie plant. It is a member of the buckwheat family and is a perennial, meaning it grows back every year. And boy does it ever! Rhubarb has a preference for warm, sunny climates, yet it is perfectly at home in the rainy environs of the Willamette Valley in Oregon. Originally from Asia, rhubarb was first used for medicinal purposes. 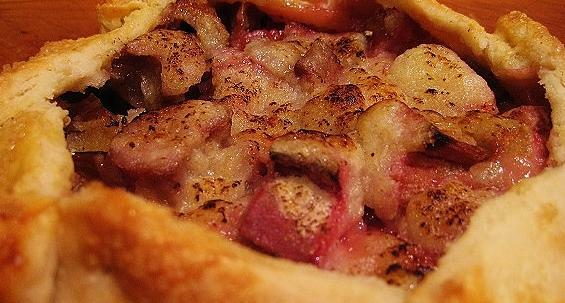 In the 18th century, the British brought rhubarb into the kitchen. By the late 1700's, rhubarb had journeyed across the Atlantic with the British and landed in the soils of early America. By 1947, the United States Customs Court of New York had officially declared rhubarb a fruit, although to this day many scientists consider rhubarb a vegetable. Rhubarb is low in calories yet high in phosphorus, potassium, magnesium, iron and vitamins, though one should avoid the leaves which contain large amounts of poisonous oxalic acid. Because it is so tart, rhubarb does require a fair amount of added sugar. 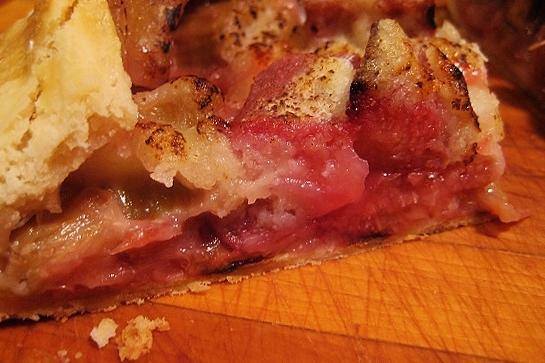 Aside from pie, rhubarb works wonderfully as a condiment for roasted meats. The tart flavor and sweet perfume of rhubarb accents duck, game, pork and lamb. 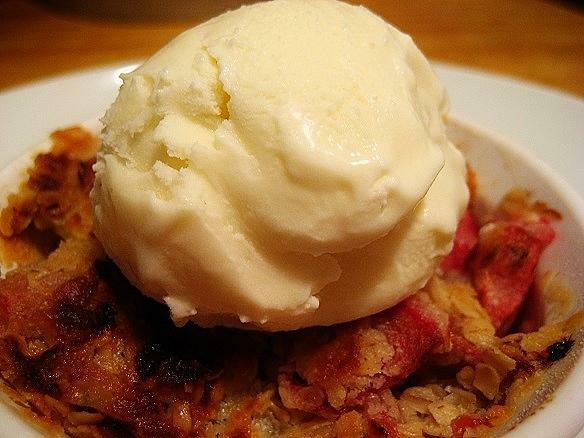 Sweet or savory, rhubarb does not discriminate. Please join me in creating, crafting and sharing the wonders of rhubarb. This looks like something that should be sold off the back of a pickup parked in a remote swamp, but I'm hoping in 30 days it will be a perfumed elixir of rhubarb vodka. I do have a pork roast lurking in the freezer, so now I'm contemplating some kind of rhubarb sauce for that - any tips on what savory flavors play well with rhubarb? I've only had sweet rhubarb like in a strawberry rhubarb pie or rhubarb jam. One of my dishes will be rhubarb chutney, a wonderful accompaniment to your pork roast. Folks must view rhubarb in a much different way in you neck of the woods, it's long been coveted here....far from forgotten. In my nearly 50 years, I haven't witnessed that kind of ignorance or disdain. Rhubarb has a preference for warm, sunny climates, yet it is perfectly at home in the rainy environs of the Willamette Valley in Oregon. Actually, it's some pretty tough stuff and needs extended temperatures below 40° F.....hardy to zone 3 which is often far from warm and sunny. Unfortunately, prime tender rhubarb season is long over in this area. My name is Katie and I'm an addict. There were a few other fanatics on eG who used to twist up the rhubarb threads every spring, but they seem not to be active now. Here's my recipe for a very basic roasted rhubarb compote. I adapted it from a recipe by Orangette, adding strawbs and bitters. Excellent with or without the berries. Trim the rhubarb ends and peel away any tough strings. I leave most of the red outer layer, especially if the barb is tender and fresh. Set a rack in the lower third of the oven and pre-heat to 350 or 375. Cut the rhubarb into 1 inch lengths. Stem the berries and cut in half if large. Put all ingredients in a casserole dish (I use a ceramic one) and stir it around. Bake uncovered for about 45 minutes so the rhubarb breaks up easily or until the texture is how you like it. I have used both white and red wine, whatever is open or within easy reach and they both work fine. I have used angostura and orange, and I like the angostura better, but I'm sure there are many other flavors that would be yummy. I eat it without any additions most often, except sometimes I throw a few chopped walnuts on it. I like it hot, I like it cold, with ice cream, creme fraiche or yogurt. Lately I've also been making a rhubarb applesauce recipe I got on 5 Second Rule, and that's SO much more wonderful than just plain applesauce. The ratio I use is approx 1 large apple to 1 stick of rhubarb, which is WAY more rhubarb than the original recipe called for. One thing about rhubarb territory: I too am under the impression that it grows best in the north, not necessarily in a warm climate. I know someone who grows it in the northern Montana mountains. I believe most of the rhubarb we get here in the Bay Area is from Oregon and Washington, but I could be wrong. Two weeks ago I bought some from a local grower at the Berkeley Farmers Market. It wasn't very red. And, surprisingly, it wasn't as flavorful is what I usually get--organic or otherwise--from the Berkeley Bowl or other large markets. Maybe just a fluke? David, rhubarb is a vegetable! Here is a little article I wrote on rhubarb for Edible Rhody about 6 yrs ago. The season is pretty much over here for the local stuff. But I do (now, after resisting it all my life) love it, and here and here are some things I make with it besides the plain but perfect stewed. When I mentioned to friends and family I was doing a rhubarb cook-off, a 15 year-old teenager let out a big "yuck," as did his Mother. (Neither have ever tasted a really good rhubarb dish). The few who said they liked it were my generation, aka 50+ years. Then again, the people I've encountered who don't care for rhubarb also don't take kindly to our most coveted fruit in Eastern, Washington--the wild huckleberry. They tend to prefer sweet Bing cherries from the orchards in Wenatchee. Depending on the amount of rain and sun in the Spring, on the West side of Washington and Oregon, we'll see rhubarb show up in May and continue into June. I live on the East side of the Cascade Mountains in the Spokane area and our growing season is typically 6 weeks or more behind the folks in Seattle or Portland. We had a mild winter with not much snow, a fair amount of sun in May then heavy rain the first weeks of June. Now our rhubarb is flourishing and the daily temperature is in the 85-90 range. A friend delivered about 8lbs. of fat rhubarb stalks just yesterday and her plants are thriving in her backyard. (We're at 2,000 feet elevation). We expect the rhubarb to taper off once we get into the hottest heat of the Summer in a couple of weeks. I feel like I should add my rhubarb compote adventure recipe, such as it was, since it was especially tasty with a good creamy plain Greek yogurt. At this point you could just add lemon juice if you feel like it needs a bit to brighten up the flavor, but since my rhubarb did not give me a nice color I also added some halved/quartered strawberries and put it back on the heat for a bit just until some of the berries cooked down, but before they all went to mush. (I forget how many - maybe 6-8 smallish berries?) Transfer to a bowl and cool. Serve over good plain Greek yogurt. Love rhubarb but the season here was at its peak a month or so ago. We had a couple of big rhubarb crumbles. And I make an Estonian rhubarb tart/cake/torte I got from the nami-nami blog -- it is really really good. Make a sweet pastry with 1/2 pound butter, 3/4 c sugar, 2 cup flour, 1 t salt. Work together until just combined, then press into a baking pan that's about 9x12. Preheat oven to 400 and cook the pastry for about 12 minutes, until slightly golden. Beat 4 eggs, then beat in 4 tablespoons sugar, beat until thick and lemon colored, then whip in 4 tablespoons flour. Pour the egg mixture over the rhubarb, and bake at 375 about 35-40 minutes, until topping is golden brown and cooked. Let cool then eat. I've been seeing rhubarb in our local grocery stores. Tomorrow I'm hitting the farmers' market to see whether the locals are offering it. Then I'll have to start choosing among all the offerings here. To date, my most pleasant experience with rhubarb has been in the company of strawberries (in a pie), or in my friend's excellent rhubarb crumble. I look forward to trying it as a compote or a pork sauce. Drats it is two week after rhubarb season here. Otherwise I would show you my lovely rhubarb sauce for pork. How about a rough recipe, or description? Maybe one of us with local rhubarb can try it. I have a ton of frozen rhubarb. I always make my mom pick it in Colorado where she lives. I take it, put it in the freezer, and forget about it lol. I need to see if it's still decent enough to eat. I freeze it and use it later for cooked dishes like chutney. I vacuum seal it in small bags. Seems to be just fine. This time around I didn't feel like futzing about with all the eggs and gelatin and blooming and whatnot, so instead I made the rhubarb syrup per the recipe, splashed some cream in (... not terribly precisely measured), thickened with xanthan gum, then aerated with the iSi. Nice and simple to make and I served it as a dip with shortbread cookies from the store. I'm sure a proper filled tart would've been better - I think I'd like this with the MC@H pate sucree - but it was simple at least. Do you think this recipe would work as a layer for a lemon bar? I was toying with the idea of modifying my lemon bars to add a layer of rhubarb between the shortbread crust and the lemon layer. Last night for dessert I made Rhubarb Crumble. It's incredibly simple--rhubarb cut into chunks and tossed with flour and sugar. I used about 3 tablespoons of flour and 1/2 cup of sugar for 4 cups of rhubarb. I like it tart! The topping is a mixture of 6 tablespoons of butter, (I prefer salted butter), 1/4 cup flour, 1/4 cup sugar and 1/3 cup quick-cooking oats. The crumble bakes in a 400 oven for about 30 minutes, then about 2 min. under a low broiler to crisp the topping. I served it with a scoop of Snoqualmie Ice Cream, (Seattle), French lavender ice cream. Hmm, I'm not sure. I think it would be delicious, but I feel like if it's between layers that you're going to cut through it needs to be fairly firm to prevent it from squeezing out the sides. I think the idea of starting from a rhubarb syrup and then thickening it somehow for a filling would work well. Maybe a syrup with less sugar could be treated like a sweeter lemon juice in a different recipe? I love a bit of rhubarb also but not sure there is any local stuff left. One of the farm markets had some leftover bits and pieces a few days ago, but probably gone by now. I will check. 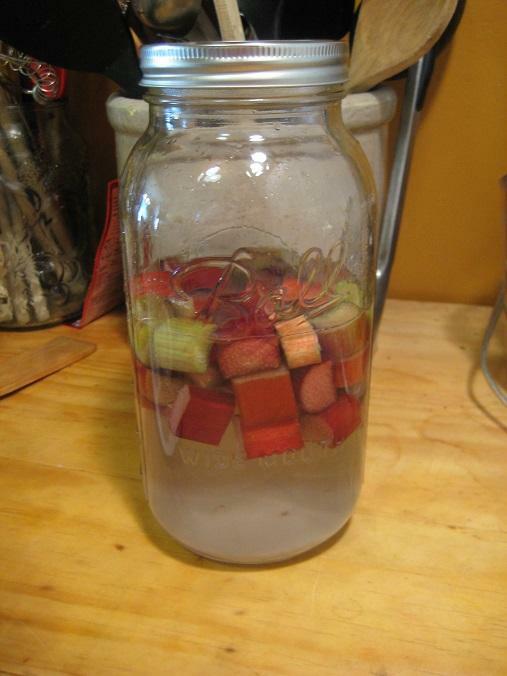 One thing I liked was making a rhubarb simple syrup - rhubarb, water and sugar - and then use it with gin or vodka. David Ross, your infused vodka sounds lovely! I wanted to try a few different rhubarb cocktails and didn't get around to it but many good starting points on the Web. One thing I really like is this idea of making a rhubarb salt for the rim of a cocktail! Margaritas would work! Chop the onion finely, clean and peel the rhubarb and chop into chunks. Add everything but 50 ml water and cornflour to the pot. Simmer for 15 minutes, remember to stir to break the rhubarb. Remember to not cook it dry. Add the cornflour mixed in the left over water, do this in thin drizzle and whisk the whole time. Take off the heat when thicken and serve with pork or chicken. Another rhubarb pastry, this time a Rhubarb Crostatta, basically an open face rhubarb pie. The filling and topping were the same as the rhubarb crumble. I used my time-tested pasty crust recipe which is a mix of all-purpose flour, cake flour, butter, Crisco, salt, sugar and ice water. Once the pastry is combined into a ball, I refrigerate it for about two hours, then bring it back out and let it come to room temperature before rolling out. I brushed it with egg wash and sprinkled some demera sugar on the pastry. Just before bringing it out of the oven I'll turn up the broiler to get a bit of char on the top. Oh have you tried rhubarb toffee? Its ACE. 50 ml golden syrup/ light treacle / cane juice/ cane syrup or honey. Clean and chop the rhubarb in to small chunks. Add everything to a wide thick bottom sauce pan and bring to the boil, remember to stir. You need a candy thermometer for this , it need to get up 125 C. When you reach this point pour out on a grease proof paper. Cool enough so you can touch it with out burning your hand of. Cut long ribbons of the toffee and either roll up on stick or just them set as ribbons. You can get the toffee up to 130 C to set it harder, but then you must work must faster with the risk of burning to make lollies and ribbons, however the ribbons just be rolled around a thick skewer to makes curls . This candy for my childhood, all natural and no colourings added. Wow, rhubarb candy is something I never thought of. The rhubarb curd I linked above might work, or something like it.